A tobacco company executive defended adults’ right to smoke when he appeared Thursday before a New Zealand parliamentary inquiry at which Maori leaders have said smoking is killing their people. Graeme Amey, managing director of British American Tobacco (NZ) Ltd, told the inquiry in Auckland that banning tobacco, as Maori legislators have urged, would merely provoke an illicit trade in the product. But Amey, who said he had quit the habit after smoking cigarettes for 10 years, evaded answering when asked if there was any such thing as a safe cigarette. Four out of 10 indigenous Maoris smoke, twice the rate of New Zealand’s overall population. Nearly 50 per cent of Maori women smoke, more than any other sector of the population, and are reported to have the highest rate of lung cancer in the world. Kiri Potaka-Dewes, chairwoman of a Maori health organization, told the committee earlier this week that tobacco had invaded the life of the marae, the traditional tribal meeting place, killing elders who are needed as role models for future generations. 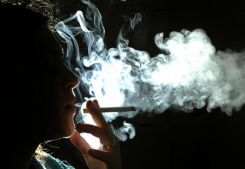 Amey, whose company has more than 70 per cent of New Zealand’s tobacco market, said cigarettes were a legal product and those who chose to smoke knew they were putting themselves at risk. Under New Zealand law, all tobacco products must carry health warnings and cannot be advertised, and Amey opposed proposals to extend the law to ban retail displays of cigarettes. The government had a responsibility to legislate, he said, but adults should have the ability to choose to smoke if they want to.